On the 20th anniversary of the storming of the Golden Temple by Indian government forces, a dramatic controversy over the restoration of the holy shrine still remains. In a documentary on Radio 4 next week, the BBC's Navdip Dhariwal explores the strange story of conflict between a Birmingham based group and professional conservationists in India. When Indira Gandhi sent the military into the Golden Temple in 1984, many parts in and around the shrine were damaged. An extensive restoration drive, which is now nearly completed, had been led by volunteers from the biggest Gurudwara (Sikh temple) 8,000 miles away - here in Birmingham, UK. However, their well meaning actions have run into a barrage of criticism from professional conservationists in India. With the Golden Temple now being considered for World Heritage status, the issue has become much more topical. For the programme, Navdip Dhariwal, the BBC's new South Asia correspondent, travelled to the holy city of Amritsar Punjab where she met a leading conservation architect, Gurmeet Rai. Rai is highly critical of the work that has been carried out and is now overseeing a complete architectural survey of the Golden Temple site as part of the bid to get World Heritage status. "I came hear and saw the sort of work they were doing I tried to get it stopped but no-one was listening. It's crass and if you are going to decorate the house of our Lord with plastic stickers then I think it is appalling." "The Harmandir Sahib (Golden Temple) is the history of the Sikh faith for over 400 years and to replace this with modern material which is historically unsympathetic is criminal," she added. Rai's criticism is backed by the Sikh historian Patwant Singh, who told the BBC that the Birmingham group has been over-zealous in the determination to serve the faith. "Generosity is fine. Voluntary service or kar seva is brilliant. But it doesn't mean ignoring principles of conservation, then it becomes an ego trip: I'll do it but on my terms. When I saw the Golden Temple finally emerge from the scaffolding and I was shocked." The Birmingham based group in charge of the restoration however hits back at criticism. Mohinder Singh, the Chairman of the Guru Nanak Nishkam Sevak Jatha, said: "History will record that I was responsible for doing the gold gilding. My conscience is clear. This is the 400th anniversary of our holy book, a very important anniversary. But, for people who made objections for nothing, the Golden Temple remains un-cleaned inside. This is the damage that was done." Gold Service: Radio 4 at 11am, on Monday 25th October. Produced by Ashok Ahir & Jeremy Davies. Presented by Navdip Dhariwal. IN THE middle of an artificial lake gleams a golden pavilion. 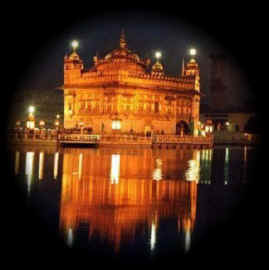 It is the holy of holies of the Sikh religion, and an architectural masterpiece to rival the Taj Mahal. But unlike the latter, this is a shrine throbbing with life. But despite all the love and attention, the Golden Temple in the northern Indian city of Amritsar is under dire threat - ironically, from pious Sikhs who devote all their spare time and money to the shrine. The original structure, a delicate brick pavilion, was blown apart by Indian army tanks in 1984, when Indira Gandhi demanded that secessionist Sikh terrorists who had seized it should be killed. Afterwards the pavilion was razed to the ground and rebuilt - but the replacement is a hulking ferro-concrete building with none of the grace of the original. him. "No, no, I chose it myself," he replied. "I don't have to get permission from anyone. I've been painting here since 1955. Nobody tells me what to do." The crux of the problem is the way the Golden Temple and all other historical gurudwaras - or temples - are run. The controlling body is an organisation called the Shiromani Gurudwara Parbandhak Committee (SGPC). But it is said to be riven by factional politics, and has no conservation experts to guide its policy. Patwant Singh said: "The SGPC has more money than they know what to do with. They must stop all physical intervention by outside bodies like the Birmingham group. They have to establish that no historical gurudwaras will be touched unless the work is vetted by them." Most of the Birmingham Sikhs have left Punjab now. One who remains, an elder named Mehnga Singh with a kindly face and a magnificent long white beard, complains of false accusations. "It was quite wrong to blame us for putting bathroom tiles in the Babar Atal," he said. "That was nothing to do with us. We only did the gold leaf work in the Haramandir. And we have nothing whatever to do with the SGPC." providing the 100 feet clear corridor after the 1984.
very vital role by playing as a pressure group. new gold sheets unfortunately over a decade would show shocking results. sanctorium can be seen) have already begun to flake. roofs to be replaced by reinforced cement concrete). buildings. Surely the Darbar Sahib complex although ?not protected? special areas such as these. think this matter requires more concerned people to join the group. and about 6 metres high. nd this as undermining the significance of a Gurudwara) . if the community and it leaders intervene with Sewa in these areas . answer any query that you may have about the matter. let me take privialge to introduce my self. My self Bikramjit Singh Lecturer Guru Nanak Dev University Amritsar. The issue mentioned is not true. I have seen the work of gurmeeti rai and of the team from UK. I was curious that what is important for the community. I do not know why many people are concerned about the holy shrine. So first of all let be clear that let us remain the shrine as it is existing. Regarding the restoration work there is no controversies only the appraoches made by both parties. I think the corelation of restoration with operation blue star is wrong basis. Why there is need to start the restoration... ?? Where is the extent of damage caused to it?? The issue seems to be old. Ms gurmeet rai has submitted the report to the UNESCo and whole drama was enacted in the presence of SGPC. It is ny humble request to strike at the right corner. The issue seems to be old. It is ny humble request to strike at the right corner. I agree to Ms Rai's efforts and feel more comprehensive approach shpuld be made. Archeologists have established that Amritsar district was a part of the vast area covered under the Indus Valley Civilisation during the early period of history. The evidence of this ancient civilisation, as discovered so far, has pointed out that the civilisation developed here even prior to the Aryan civilisation. The gazetteer of the district records that during the Vedic period, the area now belonging to Amritsar district, was believed to have been the abode of many saints and sages. Though Amritsar also came under Greek influences for a brief period, traces of the footprints of Turk, Mughal, Lodhis, Mauryas, Khiljis and the Slave dynasties can be found in ancient and medieval history. Most buildings in Old Amritsar are worth preserving for posterity. Understandably, it is quite difficult to re-discover the ancient history due to the paucity of primary sources, which were probably difficult to preserve by the people who continuously faced foreign invasions from 712 A.D. However, the new generation will have to own up the blame for demolishing heritage sites spread over four centuries. The authorities concerned have failed to preserve the one-and-a-half-century-old Sikh art belonging to the time of the legendary Maharaja Ranjit Singh, what to talk of the heritage of Amritsar district since the beginning of the 16th century when Bhai Lehna (who later became the second Guru of the Sikhs), a resident of Khadoor Sahib (Amritsar), became a devoted follower of Guru Nanak Dev. Earlier it was British, who not only renamed the historical buildings, but also demolished many sites on the pretext of modernity and development. Now, the local administration is involved. It was Maharaja Ranjit Singh who took keen interest in the development and beautification of Amritsar during his rule. He followed the Mughal pattern in laying out beautiful gardens and constructing beautiful buildings, including forts, most of them now on the brink of ruin. He got Sri Harimandir Sahib gold plated. This was how it received the name Golden Temple. It was at this time that the Sikh school of art got the much-needed patronage. However, the successive state governments, including the Badal government that had promised to give governance on the pattern of “Maharaja Ranjit Singh’s rule” and the SGPC failed to preserve the invaluable art of Maharaja’s time. Amritsar looked like a fortified city in the days of Maharaja Ranjit Singh. The fortification consisted of an immense rampart of earth and a wide ditch, apart from twelve gates, to save the town from foreign invasion. While most of the gates have been demolished, there is no trace of the ditch. Unmindful of their heritage value, most of the gates were pulled down in the past. After the death of Maharaja Ranjit Singh, many old buildings were replaced by “modern monuments” constructed by the British. The Amritsar chapter of the Indian National Trust for Art and Culture (INTACH) has documented about 300 buildings in the walled city, most of which are facing slow-death due to indifferent attitude of the authorities concerned. Dr Sukhdev Singh, state convener of INTACH, expressed his apprehensions that many of these buildings would disappear if the state government failed to amend the law to preserve heritage sites. The inventory of historical buildings, prepared by INTACH, is a pointer towards the indifferent attitude of all concerned. The 250-year-old SGPC-managed Gurdwara Lohgarh fort, constructed by the sixth Sikh master, Guru Hargobind, to secure the place from foreign attackers, was re-built with concrete structure due to indiscriminate repair done in 1997 through “Kar Sewa”. Its original design, however, was retained. The repair, carried out in 1995 with modern material, has also given a new look to the 350-year-old Gurdwara Guru Ka Mahal — the birthplace of Guru Arjun Dev. Nobody bothered to preserve the beautiful frescos of an ancient Shivala near Ghee Mandi. Another temple of Maharaja Ranjit Singh’s period — Shivala Noormahalian Da, having domes with floral pattern, is in private hands. Some of the mosques within the walled are not in good condition due to their poor maintenance. Dr Sukhdev Singh said there was a dire need to preserve buildings like Chitta Akhara, where frescos are still in better condition. Against this backdrop, the Heritage Festivals are a welcome step. However, the experience of the previous festival showed that neither the state government nor the district administration bothered to take any measures for conservation of the heritage sites. The Heritage Walk, organised last year, should have been an eye-opener for all those interested in preserving heritage. Mr Charanjit Singh Gumtala, former president of the Amritsar Vikas Manch (AVM), alleges that the Deputy Commissioner had publicly promised during the previous Heritage Festival that no building more than 100 years old in the city would be “touched” but he recommended the demolition of 150-year-old Saragarhi Government Senior Secondary School in his capacity as Project Director, Golden Temple Beautification Project. In place of this government school, a multi-crore parking complex was to be constructed. Ms Neeta Mohindra, a renowned artiste, says that it is a boon to have heritage festivals. However, during the previous festival, there was no mention of great novelists Nanak Singh, Gurbax Singh Preetladi and Thakur Singh, who hailed from the city. Holding such festivals would serve their purpose if local artistes are given chance to perform, she adds. Earlier, due to lack of adequate provisions for preserving heritage buildings, many old buildings, including Temperance Hall, wher Shaheed Bhagat Singh and other freedom fighters used to hold meetings, had already been replaced by Pink Plaza. The tehsil building, constructed in 1856, was pulled down. The portion of District Courts, constructed in 1876, has been demolished, while the rest of the building is in a dilapidated condition. The Victoria Jubilee Hospital ( now renamed as Sri Guru Teg Bahadur Hospital) is on the “hit list” of PUDA, which has planned to construct a shopping plaza .The proposal of PUDA is in gross violation of the act, as this hospital is less than 100 mt from the protected Ram Bagh. The old Sant Ram Hospital, which was built in 1904, has already been demolished. Now it is the turn of Town Hall school, a 156-year-old school. “Thandi Khuhi”, which finds mention in Punjabi literature, has been covered and “sales” are being organised there. Historical gates like Ahluwalia Gate, Lohgarh Gate, Gilwali Gate have also been demolished . 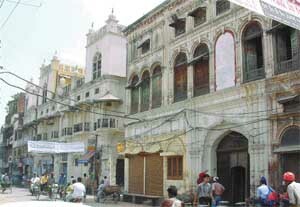 A haveli, belonging to the days of Maharaja Ranjit Singh, was demolished recently, reportedly for constructing a shopping complex. This haveli is opposite Hindu College here. This is the second haveli to be demolished in the past few months. 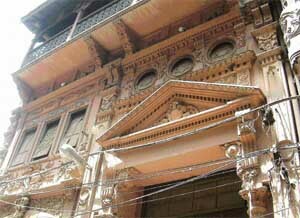 Earlier, one “Jainian di Haveli” situated at the “Chatkian wala Bazaar” in the walled city was demolished. 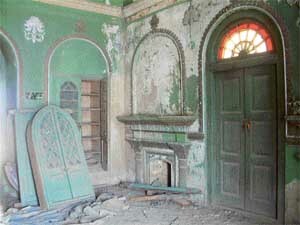 The old heritage haveli having frescos depicting Maharaja Ranjit Singh along with his courtiers holding a durbar, unique floral designs and patterns, different floor patterns, tiles and beautifully-carved wooden doors and windows — has also been lost. The walls of the haveli had a beautiful wall painting, which was white washed indiscriminately. The haveli also had unique elegant Japanese tiles. The “Mohrakashi technique” of frescos, stained glasses, carved wooden windows, floor patterns — all show that this building was a part of the heritage belonging to the British era. In his report, “Re-inventing Amritsar heritage —Agenda for action”, Mr J.K. Gupta, a heritage expert, said that haphazard and unplanned development of the city over a period of time posed a serious threat to heritage. He added that Amritsar, growing from a small village to the status of the most vibrant city and metropolitan centre, had inherited enormous wealth of heritage. The heritage pyramid of the city had been acknowledged with reverence not only within the state, but also all over the world. However, rapidly changing city profile, misuse of built space, uncontrolled traffic and unauthorised building activities had damaged the very sanctity of the heritage areas. The letter also stated that was decided that no activity in this garden, including holding of marriage parties, political activities, would be conducted and no allotment would be made to any organisation. Besides, it was also decided that the clubs functioning in the Bagh would be closed and shifted to some other place. However, holding of marriage parties, political rallies and other functions there continued unabated. Interestingly, the venue of the Heritage Festival would also be the Bagh. The Ram Bagh has a cluster of traditional buildings and canopies of traditional style. But due to the fast pace of modernisation being allowed, the Bagh is losing its original identity. Now, “Panorama”, in the name of Maharaja Ranjit Singh, is fast coming up after de-notifying the area. This is in gross violation of the law. Surprisingly, this is being done even though a case is pending in the court. The Supreme Court, in Rajiv Mankotia v/s Secretary to President of India, on March 27,1997, ruled, “ We direct Government of India to maintain all national monuments under the respective act and to ensure that all of them are properly maintained so that the cultural and historical heritage of India and its beauty and grandeur of the monuments, sculptures secured through breathless and passionate labour workmanship, craftsmanship and the skills of the Indian architects, artistes and masons is continued to be preserved. They are pride of Indians and places of public visit.” A question arises whether there is anybody to implement the ruling of the apex court in Amritsar city. Today, the Ram Bagh Gate has disappeared, while the Gobindgarh Fort is in dilapidated condition. Since the fort is in the possession of the Indian Army, even residents of the city cannot enter the building.